This page is about the 2018 trip to Egypt. For information on the January 2020 trip, click here. a trip to Egypt over Thanksgiving (November 16–23, 2018). The trip leaders are Jesse Rainbow, Keri Myrick, and Adrian Castillo. Dr. Rainbow and Ms. Myrick are the instructors for HON 4315. All the photos on this page were taken during the Honors College's November 2017 trip to Egypt. Click here to view Nour's vlog of the 2017 trip. Scroll down for more information or to submit a question. Above: The harbor of Alexandria, 2017. We will study the great works of literature, art, and architecture of ancient Egypt (3,000 to 1,100 BCE), together with several classic outsider views of Egypt, from Plato to Percy Bysshe Shelley, from the Bible to The Great Belzoni, the Italian circus strongman who made a number of important early Egyptological discoveries. Over Thanksgiving week, we will travel to Egypt to visit the antiquities and to observe firsthand the enduring meaning of one of the world’s oldest civilizations for the nearly 100 million people who live in Egypt today. Special requirements of the course: trip fee (scholarships are available), passport (must be valid through 5/23/2019), Egyptian entry visa fee ($25), some meals and entrance fees in Egypt, registration with UH Office of Learning Abroad, UH travel insurance. Above: Statue of Rameses II Mit Rahina (Memphis). What is the tentative itinerary in Egypt? Visit the pyramids at Giza, Dahshur, and Saqqara, and witness the rapid development of the pyramid form during the 4th Dynasty of the Old Kingdom. The Giza site includes the Great Pyramid, one of the Seven Wonders of the Ancient World. Travel by train from Cairo to Alexandria, through the Nile delta (historic Lower Egypt) and visit the bustling seaside city, including the modern Library of Alexandria. A walking tour of Islamic Cairo, and a visit to the Egyptian Museum, home of King Tut's treasures and many of the most important objects of antiquity, including the royal mummies of the New Kingdom. After traveling via sleeper train car, tour two days in Luxor, including the Valley of the Kings and the temples of Luxor. Above: Egypt is this many Texases big. How can I join this trip? Submit an application to participate in the trip by clicking the "Trip Application" button above. Space is limited to 16 students. When you are notified that you have been accepted to the trip, place a non-refundable deposit of $300. You can give a check to Dr. Rainbow, Ms. Myrick, or Mr. Castillo or pay by credit card in the Honors College business office. Your deposit will secure your spot. Register for the Fall 2018 offering of HON 4315 (25536) when Honors priority registration opens on 4/6/2018. Apply for financial assistance by before 4/30/2018 by submitting a letter to kdmyrick@uh.edu describing your financial situation, the resources you will have available for trip, and the estimated shortfall. You will receive notification of assistance by mid-May. Submit valid passport information by 7/2/2018. Register on the UH Learning Abroad website (summer 2018). Purchase qualified travel insurance. Additional payments will be due via student fee bill on 7/2/2018 and 9/14/2018. Travel to Egypt on November 16–23, 2018. Above: Islamic Cairo walking tour, 2017. How much does the trip cost? Are there scholarships? The tour price is $1,895. For students enrolled in both HON 4315 and the trip, generous financial support is available in the form of Lerner Family Scholarships. Eligible students can expect to receive at least $500 in aid (see below for instructions). The tour price includes round trip airfare from Houston, ground transportation via group bus and train in Egypt, airfare in Egypt, hotels, breakfasts, tour guides, and a group meal. Students will be responsible for their Egyptian entry visa ($25), site entry fees (est. $40–$80, depending on which sites you choose to enter, with an additional discount for students with identification from Egypt or other Arab countries), most lunches and dinners, individual ground transportation (taxis, Ubers), discretionary charges to hotel rooms, travel insurance (est. $20), and other personal expenses. Participants can apply for financial assistance by submitting a letter describing their financial situation, the resources they will have available for trip, and the estimated shortfall. Letters should be emailed to kdmyrick@uh.edu before 4/30/2018. Award notifications will go out in early to mid May. If funds are still available, there will be a second opportunity to apply for financial assistance in late August. Above: Milking a cow. Wall relief from the Mastaba of Kagemni at Saqqara (Old Kingdom). Creative Work or Phronesis minors or students considering these minors. The course counts toward both minors. Honors College looking for an Honors Colloquium to satisfy their upper division Honors requirements. Students and lovers of Arabic, history, classical studies, religious studies, anthropology, art history, literature, architecture, political science, and related subjects. People interested in the society, politics, and culture of MENA (Middle East and North Africa). Anyone--of any undergraduate major--who wants to enrich their Honors College experience with a high impact, short term, affordable, study abroad adventure. Current UH students may be eligible to have the cost of their passport ($110) reimbursed? Also, you can apply for a passport (and even have your photo taken) right on campus! Check out Passport for Coogs here! U.S. State Department travel advisory for Egypt. 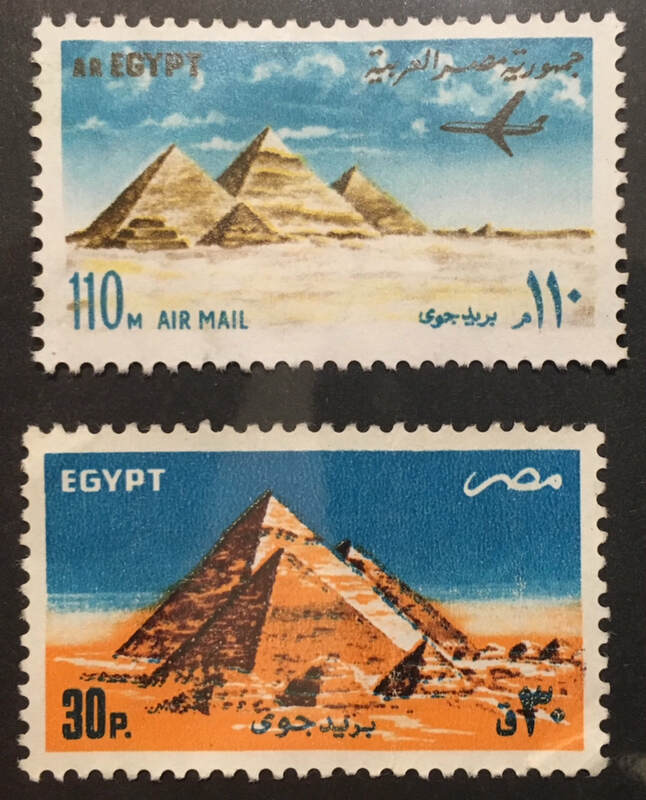 Above: 1950s postage stamps showing the pyramids at Giza.